Every day as I approach our work together, I reflect on our mission – to be a compassionate and transforming healing presence in our communities, serving those who are poor and most vulnerable. This morning I am happy to communicate to you that as a team – through our food donation drive – we truly demonstrated we live our mission and values. 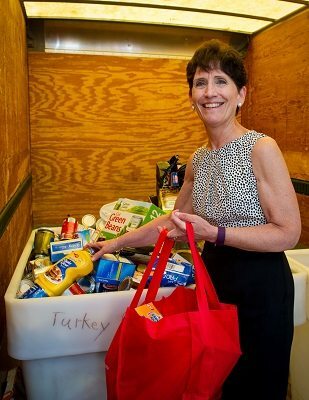 Together, we donated 2,000 pounds of food – that represents the goal for the Mayor, KeyBank, and The Food Pantries established for this food drive. Staff at The Food Pantries shared that the 2,000 pounds of food represents 1,666 meals. Our donation will clearly benefit those who are among the most vulnerable. So, as I sit here this beautiful sunny summer morning, I know I am truly blessed to be leading these great organizations – St. Peter’s and Albany Memorial hospitals – and want to express my gratitude to all of you for your selfless giving and generosity. Among our values is the value of integrity: “We are faithful to who we say we are.” We can all be very proud that through the food donation drive we have truly demonstrated we are faithful to our mission and values and have made a significant difference in providing food to the 40,000 people who visit The Food Pantries each year – 37 percent of those being children. Words are certainly inadequate to express my gratitude, but I am profoundly grateful to all of you and hope you feel some small measure of joy at the work we have accomplished. For me, this is a day to rejoice – having the privilege to serve you and allowing us to be a transforming healing presence at the very foundation of our community.